Congratulations - a wonderful achievement! P.S. : I was unable to locate the VT Quilt Show FB page. Very pretty ribbons on a gorgeous quilt, congrats Heidi. Hope you get to visit the show, lots of great quilts and vendors galore. Congratulations! A well deserved ribbon for sure! Congratulations, Heidi! You deserve it; beautiful quilting! Woo hoo! Way to go, Heidi. You've got to be over the moon; to win these awards on your very own quilt is spectacular. Well deserved recognition on your beautiful quilt & quilting!! Colette thank you so much for posting the picture! I will get there tomorrow to see it live. There were wonderful entries - and to win one of the categories is a great achievement. Well done! Congrats. We have so many talented quilters on this group. Loved this quilt...looks even better with some ribbons. Way to go! Congratulations Heidi! Your quilt is stunning! That's wonderful Heidi!!! Well deserved, your work is stunning. Thanks for sharing the great news with us! Congratulations Heidi. 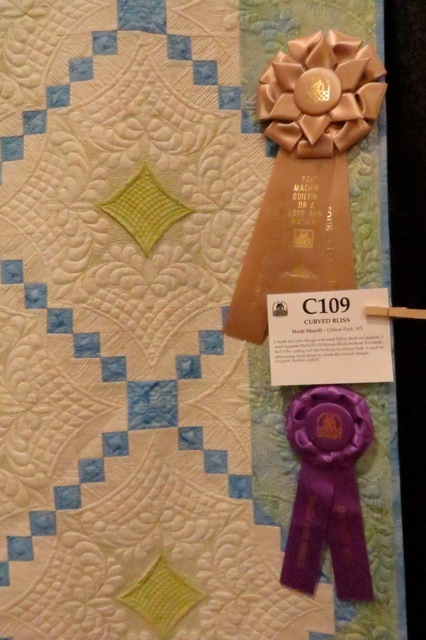 No surprise it won ribbons, the quilting is absolutely gorgeous!!! Congratulations again Heidi, you did a stunning job! Wear your contestant ribbon with pride tomorrow! Congratulations, Heidi That is a stunning quilt. Oh, Heidi, Congrats! From what I could see on here it was very well deserved. And it's your own too, how exciting is that?!?! I love meeting forum friends at quilt shows. I met up with Colette today and had a great time. It was great seeing Dawn too!